Before beginning make sure to complete the proper nail preparation. Apply DO YOU HARAJUKU?, making sure to cap the free edge. Cure for 30 seconds in the 18G LED LIGHT and repeat for full coverage. With a MINI STRIPER BRUSH and ARCTIC FREEZE create the shape of a rainbow and clouds. Cure for 30 seconds in the 18G LED Light and repeat for full coverage. With a Mini Striper Brush and TOKYO À GO GO, paint over Arctic Freeze to fill in one section of the rainbow. Cure for 30 seconds and repeat for desired coverage. With a Mini Striper Brush and POP-ARAZZI POSE, fill in the second section of the rainbow. Cure for 30 seconds and repeat for desired coverage. Next use ANIME-ZING COLOR! to fill in the third part of the rainbow. Cure for 30 seconds and repeat for full coverage. 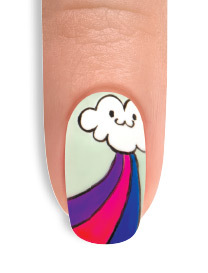 Using a Mini Striper Brush and BLACK SHADOW outline each section of the rainbow and the clouds and create a happy face in the center of the cloud. Cure for 30 seconds and repeat if needed. Apply a thin coat of TOP IT OFF sealer gel, making sure to cap the free edge and cure for 30 seconds in the 18G LED Light. Remove the inhibition layer with NAIL SURFACE CLEANSE and a WIPE IT OFF lint free wipe. Massage NOURISH CUTICLE OIL into the skin surrounding the nail plate.